The people are taking over. It is a gathering story from deepest south London of a popular uprising, of the sort that you might expect from oppressed locals against a tyrannical Conservative local authority. 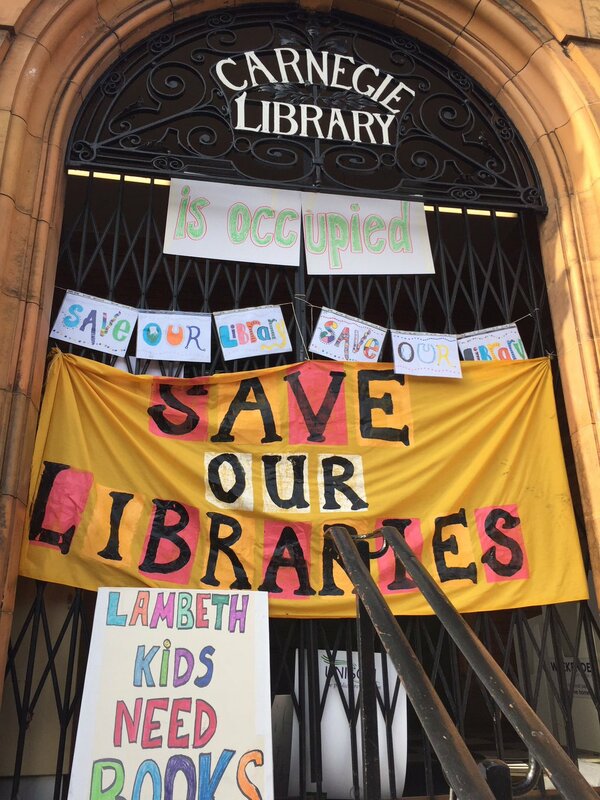 But the occupation of the Carnegie Library in Herne Hill is going on in Labour-run Lambeth, with people protesting at the closure plans for this public utility and three other libraries. This is what happens when a Labour-run local authority implements Tory cuts. The sit-in began last night. 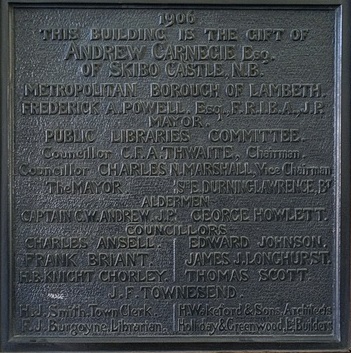 Lambeth wanted to close Carnegie and the other libraries with effect from today. Waterloo no long warrants a public library, according to the Progress-dominated “co-operative” council, which wants to hand over another two libraries to Greenwich Leisure for them to turn them into bookish gyms. 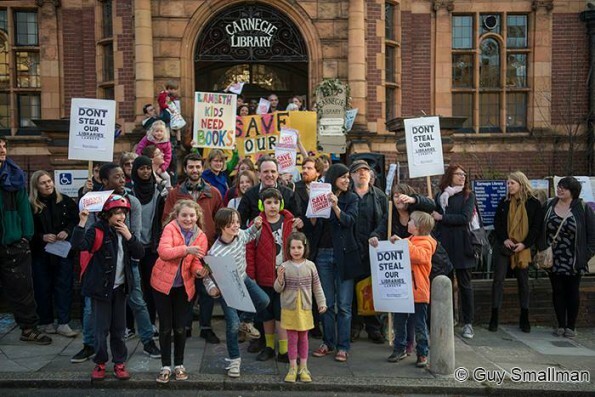 It intends that Upper Norwood Library, which Lambeth funds jointly with Croydon, is to be a librarian-free zone. The Carnegie occupiers have been provisioned with bread and pastries from a local bakery, as its contribution to the cause, and after an unusual night’s rest, the campaigners have carried into the second day of the sit-in by organising all the regular library events that would usually be held on a Friday, including a music and reading session for young children. Their elected representatives, such as local councillors or even their MP – all of them from the Labour Party – have yet to arrive to voice their support. Which is probably because some of them have been the architects of the closure policy. Meanwhile, in Croydon, funding for our libraries is to be cut, and we’re to have another consultation. Occupied Carnegie Library: how long before something similar happens in Croydon? “We will not close any libraries,” council leader Tony Newman said at least four times at the last council meeting. Other Croydon Council figures have described what is going on at Upper Norwood as “an exciting experiment”. But as we reported earlier this week, that volunteer-run model in Upper Norwood appears to be struggling, even before it formally took over the library today, with the managing trustees unaware of what Lambeth Council’s plans were for staffing, and holding out the begging bowl for £100 donations, while suggesting that they can make space for paid-for events by sticking the bookshelves on wheels. The campaigning in Lambeth is gathering strength, and amounts to considerably more than anything seen or done in Croydon, where its so-called library campaign has never amounted to much more than one woman from Sanderstead and her press-ganged daughters. Of course, the pressure point over cuts in Croydon may prove to be something other than our (outsourced) public libraries. But how long will it be before the people of Croydon will have to take a sleeping bag with them as well as their library card? This entry was posted in Community associations, Crystal Palace and Upper Norwood, Greenwich Leisure, Lambeth Council, Libraries and tagged Croydon, Crystal Palace and Upper Norwood, Lambeth, Save Upper Norwood Library Campaign, Upper Norwood Joint Library. Bookmark the permalink.